Human beings need enlightenment. The essential recognition of our True Nature is just that, essential. Enlightenment is not something that is nice to have. This Awakening is not optional and is most certainly not reserved for a small circle of practitioners. Rather, enlightenment is an absolute necessity and a core requisite for the full inhabitation of our humanity. Our full radiant and flowering embodiment requires our greatest Liberation; And transcendence is incomplete without the descending current of your radical embodiment. Enlightenment is not unidirectional. This Awakening is not only transcendence and the vertical ascent of consciousness. Rather, your essential condition is radical Liberation and unconditioned Embodiment through the very form of your body-mind that is opening and closing as you read these words. When we look into the major issues facing humanity today we can feel addiction stripping Beauty from our human unfolding with virtually no person on our planet free from knowing the ripples of this disease. As our hearts open we can feel ourselves quiver in the face of the atrocities against our Dignity found in human trafficking and slavery. As our minds open we can see the dire energy crisis and the urgent necessity for solutions to climate change. When we stand toes wide open feeling into the earth, heart extending as the infinite horizon we feel the immense sorrow in our historically-conditioned lack of kindness toward one another. Life’s global challenges as well as our conflict with those closest to us and within ourselves demand our Unique Beauty. It is within this Embodied Realization that the survival of our planet rests. The human inhabitation of a radical clarity and sanity is not optional but an absolute necessity. Your call for an enlightened life demands your greatest practice to participate in the conscious unfolding of this moment’s Life and Love. that of your central Transcendent Awakening and the Ecstatic Urgency of your Embodied Becoming. 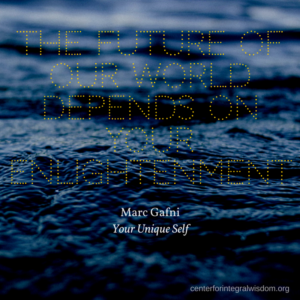 In the understanding of Marc Gafni’s Uni que Self, Enlightenment is not only the direct experience of your Original Face but is also the full articulation of the Divine’s Unique Embodiment as your Evolving Becoming. Nothing more is required, yet absolutely nothing less is required. Transpersonal Psychology is a field ultimately valuing one central aim: Service. It is here in open-hearted service that this force in psychology joins with the full bouquet of humanity’s offerings. At the heart of this field of psychology we find an uncompromising aim to honor and serve both the Fullness of our earthly Embodiment exactly as it is as well as the Awakening to the dimensions of ourselves that Transcend. In this process of service the transpersonal cradle has nurtured a uniquely Western understanding of an all-stage and all-state approach to psychology and spiritual practice. This psychological vehicle has moved us to ever more inclusive frames of reference through which we navigate the perennial journey we all travel from birth to death. Ultimately transpersonal psychology continues part of the great Yogic tradition that inspired its birth in the West. As Swami Vivekananda, one of the first Yogis to step foot in the United States, ignited the World Parliament of Religions in the heart of Chicago in 1893, he catalyzed a novel synthesis of East and West. It would be William James, the great philosopher who birthed modern psychology, who would pick up this yoking of science and religion, of spiritual experience and the well-being of human kind to offer the West a new science, study, and ultimately a new integrative lens through which practice can unfold. In this article we will refine a deeper merger of transpersonal psychology with the dual currents of Integral Yoga. We will explore the need for Transcendence and the necessity for the Embodied Transformation of every facet of your becoming. This radical inhabitation of your humanity as Divinity is nothing other than your own Unique Self. It is the Preciousness of your Unique Gifts that our world is dying for, and without which part of the Divine dies. One of Sri Aurobindo’s central contributions to the West is his pioneering synthesis of Eastern and Western spirituality found in his Integral Yoga. This embodied synthesis of Yoga was simultaneously nothing new to the deep waters of the Yogic tradition, yet also a novel articulation and Embodiment of the Yogic path. Put simply Integral Yoga is the Union of all parts of one’s being with the Divine. Aurobindo was clear that Integral Yoga is not the development of a singular dimension of the self and its union with the Divine. It is not the joining of, for example, just your awareness with the non-dual. The path laid before integral practitioners is not a return to an eternal perfection found elsewhere with only a part or a fraction of your being. Rather the integral path before you is the complete Perfection of life here and now as you, all of you. This Practice is the complete union of every facet of your being with Divinity. It is here that we find the dual currents of Integral Yoga, the Two Tastes of your timeless unfolding enlightenment. It is Being plus Becoming. It is Ken Wilber’s Yoga of joining horizontal enlightenment with the always emergent evolution of vertical enlightenment. Integral Yoga is the yoking of your Essential Freedom with your Embodied Divinity through your own Unique Fullness. The central culminating point of enlightened Realization is precisely who is reading these words. Your timeless yet evolving path is the Embodiment of the Divine through the vehicle of yourself. This necessitates both the complete transcendence of your nature as the essential path to Liberation, as well as the transformation of your nature through the taste of what you are Becoming. Every facet of you is reformed, aligned with and transmuted to your essential Uniqueness. The novel teachings of the Unique Self as articulated by Marc Gafni are again the perennial teachings of the great lineages that are now held in the integral embrace. And these practices are today’s synthesis of the Timeless teachings as they unfold in the particularities of each of us. The Unique Self is in many ways our own emergent Embodiment of Integral Yoga. Before we open more deeply into the heart of our exploration of the Unique Self, let us briefly touch upon what this Yoga is not. The Unique Self does not commit the central tragedy of humanity. This is to say your Unique Self does not limit love. Love is not an emotion at its infinite center. As Gafni puts it following Wilber’s post-metaphysics, Love at its core is a perspective. Love is fundamentally a perception, a perception of unity and oneness that is so radically liberated that you embrace the fullness of duality’s particularities. As such, the Unique Self does not place anything on the outside. Your habituated self often places people, landscapes, ideas, beliefs, practices, beings and even parts of one’s own self on the outside of a fabricated circle of inclusion so that your conditioned self feels as though it is on the inside. This is not the Unique Self. There is no part of yourself that is not to be yoked to Divinity. Your true Uniqueness does not fabricate pseudo circles of inclusion. The Unique Self is never threatened by what is often perceived as Other. Your conventional self is competing with, negotiating with and ever maneuvering around others to protect your relative distinctness. This activity is not your Unique Self. Uniqueness is not dependent upon relative comparisons or measurements of any sort. Nor is the Unique Self something that belongs to you. Your Uniqueness is not something that you can possess as your presumed separate self does with conventional traits, attributes and skills. While your Uniqueness is yours, this is something that you inhabit (or, That which inhabits you). Your Uniqueness is not something extra for you to control or manage. It is not something to be leveraged as you might leverage that which you believe makes you special from a conventional perspective. Your Unique Self is not the dimension of you that is compulsively driven to cover up emptiness in your life. Regardless of how skillful, beautiful and appealing the conventional self’s endeavor may appear (or not appear), the Unique Self is not the habituated activity attempting to cover up the void that your conditioned self’s activity often weaves. The Self we point to here is not a separate self resting upon fabricated divisions. Your Uniqueness is not your habituated self’s attempt to avoid the Emptiness or Pregnant Void of Being. If you are not directly informed by and infused from crown to toe as the non-seeking Emptiness of Being, if the Transcendence of No-Self is not resonating as Love and Light in your shimmering cells, then you are stuck in the relative. This is not the Uniqueness we speak of. Finally, your Unique Self is not optional. This Integral Yoga of the Unique Self is an absolute necessity and thus you are obligated to fashion, refine and offer your greatest gifts in service to your full participation with and as Divinity. You are required to serve from the most beautiful, true and loving embodiment of yourself as the gesture of your Realization. Your Unique Self is the union of your True Self and your Unique Perspective. This post-enlightenment state is the result of yoking your body-mind’s Full Embodiment with your most Free Liberation. Your Uniqueness is known through the fundamental Transcendence of all form. From this formless divine Union you know yourself, every facet of yourself, as a special articulation of the One. Your unique body-mind is the vehicle through which the pure, vast and unqualifiable Emptiness is known through form’s intrinsic diversity. Your Embodiment is irredeemably distinct, yet always known as a special part of the larger whole. This Self that we point to is the enlightened Realization of your Uniqueness. 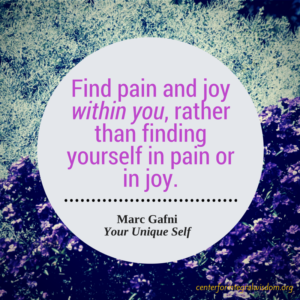 Feel into the specific point with which your body-mind rests right now. Only you stand as the timeless unchanging Divinity known as your specific unfolding and evolution of Becoming. To inform, guide and possibly facilitate the stability and evolution of your own Unique Becoming we will next consider this Integral Yoga from a psychological perspective. We will go on a journey through Susanne Cook-Greuter’s conventional and post-conventional stages of ego development. As you read, practice inhabiting these perspectives as a means of clarifying the evolving nature of your Unique Self and how you can participate with greater fullness in the integral yoking of Being and your Becoming. Ego development provides a lens through which you can feel and see how perspectives, needs and directed actions towards meaningful ends transform and evolve into ever greater expressions of Embodied Fullness. At each stage of ego development you will briefly explore functional capacities and the state-stage expressions of the Unique Self. As you read, bring awareness as to where you are reading from. Notice how the stages through which you have progressed through can be felt, related to and clarified. Take note of what attracts your curiosity and what invites greater insight into your your integral yoga of the Unique Self. Finally, you may want to notice the ego stages that you have yet to developmentally establish and feel into the pull of your own evolutionary unfolding. The first conventional stage of ego development we will cover brings with it the emergence of self-reflectivity, that is the capacity to see oneself as an object from a distance. For the first time in development the self can clearly reflect on itself as an object. That is I can see myself from a third person perspective. As such this provides us with a useful starting point to explore the Unique Self. Along with this perspective of the self comes an emphasis on autonomy and agency. The self is no longer exclusively defined by others and the self’s relationship to groups, thus there is a pronounced focus upon and need for one’s own distinctness and difference from others. Along with this individuality and autonomy comes the anxiety and fear of being incomplete and losing newfound distinctness. The Expert/Technician is particularly insulated from the Realization of No-Self because of the heightened fear of losing distinctness. Disciplined practitioners who commit again and again to their formless and non-dual state-stage practices are rewarded generously with the deep relief from the anxiety inherent in manufacturing a fabricated separate self. The Unique Self at this stage offers a crisp realization of intrinsic distinctness while also infusing being with a timeless sense of belonging to the Fullness of life. Your Unique Expert/Technician still retains functional emphasis upon your developing agency; however, you now enjoy a grounded sense of confidence in their differences instead of the anxiety of standing upon distinctions that must be defended and guarded. The Integral Yoga of your Uniqueness at this stage is expressed through a more liberated expression of yourself and your gifts. This stage is the target for most of Western culture’s mainstream education and training. The Conscientious/Achiever deepens self-reflectivity adding the understanding of the self through the lens of linear time. For the first time true sustained introspection emerges, with inquiries such as “Do I live up to my values?” and “Why do I act in these ways?” appearing. This enables the Conscientious Achiever to understand themselves more fully. You now can embrace your past and future selves in your present unfolding. Enduring traits can be seen clearly and understood as this introspective self becomes more invested in the future-orientation found in ideals, goals and the aspirations of the self. You need to feel in control of both yourself and your environment such that the Conscientious/Achiever can continually engage in meaningful action that progressively moves you towards your goals. Principally this stage of ego-development highlights a self with a strong emphasis upon where it is you are headed. The Unique Self at this stage is commonly hidden within the knot of habituated activity aimed at goal directed action. Once again the seasoned practitioner’s commitment to the Realization of Emptiness and Non-Duality can unwind this knot of habituation and realize their True Nature and the radical preciousness of their intentional and purposeful activity. This frees up more energy, opens creativity and allows for a more skillful engagement with achievement and the actions required therein. The Unique Self is most readily experienced in this stage as a special plan to actualize one’s unique gifts to the world. Your Conscientious/Achiever’s Uniqueness is both a special set of gifts that are particular to you and simultaneously a plan to manifest your true offering. One common feature of the habituated Conscientious/Achiever is a tendency to over-extend the self and its resources in relentless action towards achieving goals. The Unique Self at this stage relaxes this tendency. Instead of a functioning to achieve purely on hard work and conditioned effort your Unique Self yokes together this intense driven work ethic with a spacious trust and surrender. As a result, the essential Uniqueness is expressed with grace, and progress towards goals is made with much greater ease and effectiveness. The Unique Self does not negate, remove or in any way devalue purposeful worldly aims. Rather your Uniqueness is clarified, deepened and liberated to radically embody the skillful articulation of the self’s most precious gifts. In the Unique Conscientious/Achiever you find worldly effort infused with otherworldly elegance and poise. The Individualistic/Pluralist stage of ego development is the first of our post-conventional stages. The self awakens to the perception that one’s detached objective rationality so prized in the preceding stage is a distorted assumption. The self in this stage gains the capacity to watch oneself trying to see and make sense of oneself. Herein we find an important shift in perspective. This newfound vantage point highlights the participatory nature of observation and you can now see the co-creative dimension of the self. No longer do you fashion yourself based on reasoned decision, but rather your self is understood to arise collaboratively from the immediate contexts and relationships in its surrounding. The self sees how it can never be fully released from these participatory influences yet the self has a strong need to re-fashion and redefine itself independently from all that has gone before. As an Individualistic/Pluralist, you see how your self is much more fluid and informed by the ever changing cultural contexts and relationships unfolding. And in time this gives rise to one of this stage’s central sources of anxiety. With the perception of the diversity of expressions of yourself comes the driving need to integrate all of the different parts of yourself. Any sense of an inability to integrate the divergent dimensions of yourself culminates in an anxiety around not being able to find your true self from a relative perspective. As you shift from conventional stages to post-conventional stages of ego development you find a qualitative shift in capacity to inhabit your self’s distinctness. Social conventions are no longer as structurally defining to you which allows the Individualist/Pluralist to be yourself in new ways which in turn allows greater space for others to be who they are with less judgment and more open expectations. For the first time you are consciously oriented toward the present moment and the intentional inhabitation of raw subjective experience of life and its unfolding. You enjoy a newfound unconcerned energetic self-expression that inhabits more spontaneity. Additionally this stage of ego-development brings forth an inward search for your unique gifts, not born through social values and social conditioning but through self informed values forged through intense self-inquiry. The Unique Self at this stage is fueled by the vivid individualism and burning need to fashion oneself and one’s accomplishments independent from social conventions. As such your Unique Self retains a liberation and freedom that informs and supports you with embodying your own multiplicity and diversity in flexible ways. While there is still uncertainty as to who your true self is from a relative perspective, the realization of your Transcendent Self or True Nature provides you with a confidence and fluidity in exploring yourself without many of the cumbersome social constraints. This post conventional inhabitation of Uniqueness also brings with it an important shift in terms of embodiment. For the first time you find a shift away from intellectual awareness and conceptual understanding of yourself and your Uniqueness. Your Unique Self is no longer exclusively felt through concepts, values, goals and aspirations but now as an organismic or embodied presence. The specialness of your perspective expands and is felt and understood not only to be what and how one sees but also how the body feels and digests experience. As such your Unique Self for the first time finds the vehicle of the body as a visceral emanation of True Self’s specific articulation of Light and Love. This stage of ego development inhabits what would be first recognized as an integral stage of development. Self understanding is born within a larger worldview that grasps many interpenetrating systems. Multiple systems of relationships and processes can be seen and understood including for the first time developmental functioning in past, present and future evolutionary possibilities. As such, cultivating and attending to your own self-development and actualization becomes an essential need at this stage. Another defining capacity is the recognition of your ability to generate meaning. Thus the Autonomous/Strategist feels the responsibility to author one’s full story that gives rise to a life that is more integrated, alive and connected. The central anxiety of this stage is your fear of not giving birth to your full or ultimate potential, or living a life that is not in deep congruence with the universal principles and values held most central to your ongoing evolution as a human being. Socially there is a distinct shift away from autonomy into a recognition of a need for community and authentic relationship. While previous stages have emphasized autonomy, either in the compulsive need to defend oneself from others or in the necessity to redefine oneself independently from all that has gone before, this stage openly acknowledges how you need authentic dynamic relationships. In this stage you come to know that wisdom and insight necessary for personal transformation are born through deep exchanges with others. Thus you move towards authentic communion and true intimacy in service of developing yourself more fully. The Unique Self is the radical inhabitation of the Self’s Full and Liberated potential. 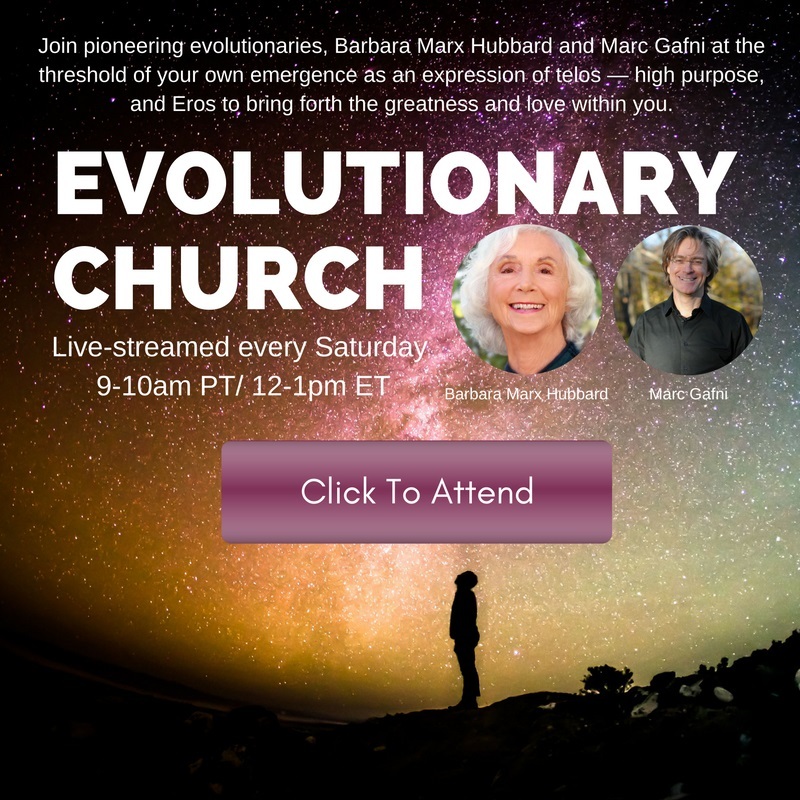 Therefore your Unique Self holds little to no concern about Embodying your highest principles and unfolding your most unique evolutionary emergence, yet you retain a natural focus and engagement with fueling your evolutionary impulse. Part of the way you express your Unique state of embodied consciousness is through your active commit to your self-actualization. This is an expression of your ongoing and always emergent Uniqueness. The Uniqueness of this stage is much more integrated in terms of its capacity for embracing multiple stages of development. As a result, your Unique Gifts are more readily accessible to others and often geared toward helping others grow and develop. This is in contrast to the preceding stage’s Uniqueness, which can be more difficult for others to understand given its hyper-individualism and necessity to fashion itself apart from social and cultural conventions. The Unique Autonomous/Strategist embodies several other qualitative leaps forward. Your capacity to tell a truly new story, a full story of yourself and your life is strengthened, clarified and aligned with the realization of your True Self and your Non-Dual inhabitation of your body-mind. For the first time non-possessive Love becomes readily accessible to an open heart. While this transmutes interpersonal relationships deeply, we also find a newfound heart space catalyzing transformations in intrapersonal relationships. In this stage you find an integrative embrace of your essential Liberation. Your diverse inhabitations of Form result in a refined attunement with disparate parts of yourself which become a more unified synthesis. The capacity to work with shadow material increases dramatically. As such, the unlived and unloved dimensions of the self, the parts of the self that are untold and unconsciously denied can be more readily integrated in order to unfold and evolve the Becoming of your Unique Self. This stage is the first of two post-conventional unitive stages outlined by Cook-Greuter. As development progresses into these transpersonal structure-stages the ego becomes radically transparent to itself for the first time. The ego is known and felt as a central point of personal consciousness for the metabolism of most experience and the focal point for self-identity. In seeing this intrinsic ego-centricity the ego is known as that which inhibits further ongoing development. Any sort of ultimate knowledge of the self is known to be unattainable through the activity of rationality and habituated effort. As a result Construct-Aware individuals allow their ego’s functioning to unfold naturally; However, this activity is largely no longer tied to the governing agency of the self. Thus your ego activity is another dimension of experience to witness and is not followed compulsively, aside from a subtle attachment to a division between self and other. This is the first stage in which all of your experience is understood through a developmental-evolutionary perspective. In this stage you have open access to inhabit previous stages of ego-functioning more freely and use these as vehicles to effectively connect with others at divergent stages of evolution. Your embrace of life and yourself is so integrative that existential paradoxes are now held readily in consciousness. While these can still bring forth inner conflict, Construct-Aware individuals have an expanded capacity to accept many forms of dissonance and paradox. Those at this stage feel the tension of duality and paradox while simultaneously intuiting their underlying unity. One of the last egoic contractions to remain hidden is found within the feeling that nobody understands you. This anxiety stems from the reality that there are few individuals who organize themselves and their lives from this stage of ego development. As a result, in your private moments you can feel alone and isolated. While you are deeply capable of attuned relationships with others you yearn for others to radically attune to the fullness of your own seat of functioning within. Your Unique Self’s grounding in Emptiness accentuates and refines this stage’s openness and fluidity for inhabiting the full spectrum of your development. As such Construct-Aware individuals’ already mature integral embodiment and consciousness is clarified and refined. Your Unique Gifts of this stage of functioning again expand, open and embrace more and more people into the scope of consideration for service. Your Unique Self focuses upon your own specific gifts yet your perspective prioritizes all beings from a global-historical perspective. The Uniqueness of this stage is often drawn into a profound simplicity of service, the desire to embody Love and Kindness and the work towards the liberation from suffering for all beings are a few examples of this service. Your Construct-Aware Unique Self often shapes your gifts to become catalysts and transformers for the larger unfolding and evolution of manifestation. The Unique Self’s grounding in non-duality releases this stage’s central egoic attachment, that of the division between self and other. Your sense of isolation and essential loneliness dissolves into the intrinsic open joy of non-duality where self and other are tasted to be not-two. Thus the core issue of not being understood dissolves in this state-stage as the Unique Self embodies connection and intimacy in ways unseen by the Construct-Aware ego. This final stage of ego-development embodies an entirely new way of metabolizing human experience. Instead of orienting through life exclusively from the self’s limited egoic perspective, this transpersonal self is intrinsically wed to a universal or kosmic perspective. You have a conscious connection with the ongoing unity embedded in all of existence. Reality and self are known at times as limitless Emptiness, the unifying ground of consciousness. You feel radically a part of and belonging to the unfolding humanity and kosmos as a whole while simultaneously feeling your own particular separateness. The Unitive/Ironist is both a separate and distinct self while also fluidly identifying with all other beings and manifestation itself. Your Unitive/Ironist inhabits and embraces a broad multiplicity of perspectives and can effortlessly shift among many states of awareness. Peak experiences no longer have an out of this world quality to them. Instead peak experiences and deep shifts in consciousness are now familiar ways of being and experiencing life. You accept both yourself and others fully as you co-arise in the moment. Higher stages of development are no longer viewed as being intrinsically better. Others and parts of one’s own self are deeply respected in their essence as there is a complete non-controlling space for them to be exactly as they are. You see, feel and know the dignity and divinity in all manifestations of life and can know and experience all of these as your own transcendent self. The Unique Unitive/Ironist is in many ways the structural-developmental establishment of the state-stage Unique Self. 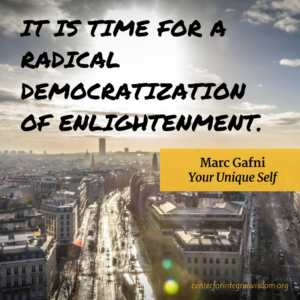 This developmental shift deepens both the Liberation and the radical Embodiment of the Unique Self. You know yourself to be an alive ongoing evolution of the universe in all its aspects and you are intrinsically drawn towards the compassionate engagement with the central dilemmas facing the human condition and the evolving kosmos. At this stage you find yourself immersed in a joyful spontaneity and a streamlined simplicity of your embodiment that fully articulates the heart of wisdom and liberation that is the essence of your Unique Self. Give the gifts that alone are yours to give. In order for you to give your most precious gifts, both to yourself and the world, you need the Integral Yoga of the Unique Self. The true gift that you are in the world stems from your Divine roots. You must fully inhabit, without boundary, your embodied enlightened consciousness for it is from this seat that your human nature transmutes from habituated contraction to Liberated Fullness. The heart of your humanity is incomplete if your Essence is obscured and your action in the world is not seen, felt and known through the Divine’s eyes. We are all born into the responsibility to shed our conditioned human perspectives and in the process stand fully in our most essential Divine perspectives and then, from this vast liberated space, Embody our radiant Humanity. We do this through Emptiness – and by this I mean that we inhabit the form and expression of our humanity knowing ourselves completely without boundary as the formless empty ground of Being. We must wake up to see ourselves, our lives, our environment and all of our interpenetrating relationships from the eyes of Divinity. As we have briefly seen the Unique Self relieves some of the central points of anxiety and suffering within each stage of ego-development. This is to say each stage functions more fluidly, opens more readily and lends its gifts more freely from Uniqueness. The Unique Self is one important piece of the puzzle for cultivating the greatest health of the overarching spiral of human development. To inhabit a stage of development without the Unique Self is to stunt, limit and contract each stage’s full inhabitation of our health and wellness. In order for the full inhabitation of humanity as Divinity to occur we must collectively yoke the realization of our timeless seat of Being, our fundamental ground of radical Emptiness, with our deep embodiment of our precious, ecstatic and evolving Becoming. The challenges we face in our human family and our wider circle of life demand our true Greatness. The Divine that the Unique Self sees itself surrounded by is demanding our inspired Gifts. What is needed now more than ever is the dedicated practice with the Integral Yoga of the Unique Self – the commitment to integrate and inhabit the completeness of our ourselves in order to invite, establish and ultimately celebrate our greatest beauty, truth and integrity. In order for us to address the lack of kindness our habituated selves all too often inhabit in our lives, we need to yoke the True Self to every facet of our Becoming. The crises of our times require our collective Unique Selves to act with deep integrity in our world, limitless open love in our hearts and radical sanity in our minds. This is not a polite call inviting us, but rather a demand addressing each of us by name. Divinity is not asking for someone else, only the Unique You. So, feel with your Divine’s Heart and fall in love with every aspect of both Being and Becoming. Step into the fullest expressions of your Gifts and serve as your Unique Self. Breathe into your toes, feel the ground beneath your feet, radically open your eyes, empty your heart with your exhale and Give. Give You, nothing more but nothing less. Rob McNamara is Author of Strength to Awaken, a skilled Psychotherapist, leading Performance Coach, Psychology Professor at Naropa University and an Integral Zen Practitioner. He runs his private practice in Boulder Colorado serving a broad range of executives and professionals, undergraduate and graduate students and athletes ranging from high school to Olympic and professional world champions. Rob has been lecturing on Integral Psychology and Human Development at Naropa University for nearly a decade for both graduate and undergraduate students in a number of academic and professional programs including the MA Transpersonal and Contemplative Psychology programs and BA Contemplative Psychology program. Currently Rob co-teaches Therapeutic Applications of Human Development and teaches graduate and undergraduate courses on Transpersonal Psychology and undergraduate courses on Integral and Developmental Psychology. 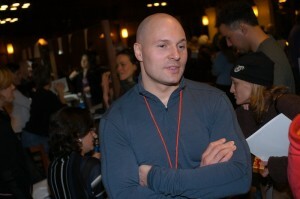 He also serves as the faculty advisor for Integral Naropa.